The Leader of the Patch. PIPEWORX LTD. ANNOUNCES ACQUISITION AND PARTNERSHIP WITH WOLF PROJECTS LTD. It is with great pleasure that Pipeworx Ltd., a leading pipeline and facility contractor based in Spruce Grove, Alberta announces that it has acquired 100% of the shares of Wolf Projects Ltd.
Pipeworx Ltd. was founded in 2004 as Horseman Energy Services in Dawson Creek, British Columbia. In September of 2007, Horseman acquired the Kellam group of companies of Spruce Grove, Alberta and rebranded under the Pipeworx banner. 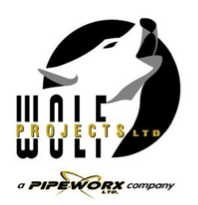 Wolf Projects is an Okotoks-based facility and pipeline contractor operating across the WCSB but primarily focused in Southern Alberta and Saskatchewan. These are key areas that complement the existing geographic coverage of Pipeworx. Each of Kellam and Wolf operate as wholly owned subsidiaries of Pipeworx, with Pipeworx providing strategic direction and management. Together, the three companies now have field offices or bases of operation in British Columbia (Dawson Creek), Alberta (Grande Prairie, Hinton, Spruce Grove, Okotoks/Aldersyde) and Saskatchewan and provide small to mid-diameter pipeline construction and maintenance services to some of the largest E&P companies in Western Canada as well as some of the most dynamic juniors and royalty trusts. In addition, the company provides facility construction services. Jason Ortt, newly appointed Vice-President Operations, Southern Alberta for Pipeworx and former owner/manager of Wolf Projects Ltd. added: “We are delighted to join and be part of the Pipeworx group. We are already realizing a number of synergies on projects and I am personally excited to commit myself to this young and dynamic management and executive team as we continue to grow our business and provide top quality service to all of our clients. The combined company boasts in excess of 13 pipeline and facility spreads with the capacity to grow by an additional 3-4 during peak winter months. In addition the company’s combined fleet includes more than 22 excavators, 8 dozers, 19 sidebooms, and over 35 crew trucks as well as all related tools and equipment. Pipeworx and its subsidiary companies are dedicated to the highest standards of safety and quality and are fully licensed and qualified to operate in British Columbia, Alberta and Saskatchewan.